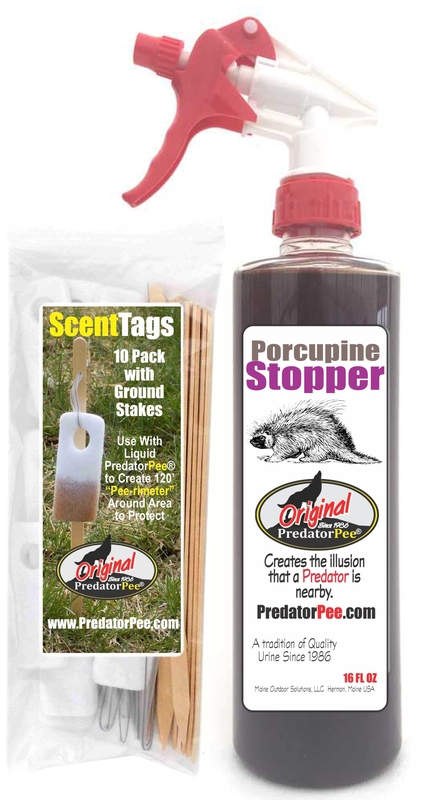 Original PredatorPee® PorcupineStopper 16 oz - ScentTag Combo Pack. Each 16 oz natural porcupine repellent spray bottle comes with a trigger sprayer top and a 10 pack of Scent Tags, twist ties, and ground stakes. Place the Scent Tags every 10-12 ft using the included twist ties and ground stakes. Saturate with “pee” to create a long-lasting “pee-rimeter” - Big Savings when you buy multiples!